Mr. Justice Muhammad Faisal Kamal Alam in his judgment has decided the issue regarding inclusion of written test qualified candidate for new recruitment under the selection process in Constitution Petition No. D-2378 of 2017.
a) Declaring that the requisition and subsequent advertisement No.01/2017 dated 14.04.2017 to the extent of recruitment to the post of deputy Prosecutor General, is illegal, unlawful, unconstitutional, mala fide, arbitrary and in violation of principles of natural justice, equity and fairness, made without lawful authority and accordingly void ab-initio to set aside the same unless the previous examination result and merit list prepared by the respondent No.3 i.e. Sindh Public Service Commission in pursuance of Advertisement No.05/2011 dated 22.10.2011 are incorporated and given preference for the selection of the Post of Deputy Prosecutor General Sindh. b) Restraining the respondents from making recruitment to the posts of Deputy Prosecutor general till the final adjudication of this Petition. c) Directing the respondents No.1 to 3 to abstain from going beyond their jurisdiction / authority / domain and acting against the interest of Petitioner or violating his fundamental rights. d) Directing the respondent No.3 to conduct the interview of the successful candidates vide press release No. PSC/EXAM:(S.S) 2012/ 694 dated 10.07.2012. Any other relief(s) which the Hon?ble Court deems fit and proper under the circumstances of this petition”. 2. The undisputed facts are that earlier Petitioner in response to the Consolidated Advertisement No.05 of 2011 (Annexure “C” of the Petition at Page-21) had applied for the post of Deputy Prosecutor General in Basic Pay Scale (BPS-18). The basic eligibility criteria was also mentioned in the said Advertisement, inter alia, lower and upper age limit as 25 and 35 years respectively. The Petitioner since fulfilled the basic criteria took the Pre-interview Written Test and was also declared successful as evident from the Press Release (available at Page-25 as Annexure “D” of the Petition). According to Mr. Shuja Abbas, the learned counsel for the Petitioner, the Interviews could not be conducted as in a subsequent Press Release dated 31.01.2013 (Annexure “E”), the Interviews were postponed, and it is not a disputed position, as also evident from the para-wise comments of Respondents that the Interviews were postponed on account of litigation sub judice in this Court at that relevant time in the shape of Constitution Petition No. D-3735 of 2011. However, Petitioner did not participate in the current Selection Process under taken in pursuant to the impugned Advertisement No.1/2017. 3. Mr. Shuja Abbas, the learned counsel representing the Petitioner has placed reliance upon the reported decisions of Javeid and Azhar cases [supra]. According to Petitioner’s side, once the latter was declared successful in the pre-interview written test, then atleast he should be considered in the present ongoing Selection Process for the Post of Deputy Prosecutor General, which is being under taken in pursuant to the impugned Advertisement No.1 of 2017. It was further argued that in the above cited Azhar case, the Hon’ble Supreme Court has laid down the Rule that Post in BPS-17 and above can only be filled through Public Service Commission and that too after publishing advertisement, in order to ensure and maintain merits and transparency in Selection Process. 4. On the other hand, learned Standing Counsel for Respondents has argued that presently the Selection Process has been conducted in a transparent manner, but earlier the same (Selection Process) could not be completed due to restraining orders of this Court in the above referred Constitution Petition No. D-3735 of 2011. The Respondents have also appended with their para-wise comments the restraining order passed on 21.01.2013. 5. It was stated at Bar by the learned A.A.G. 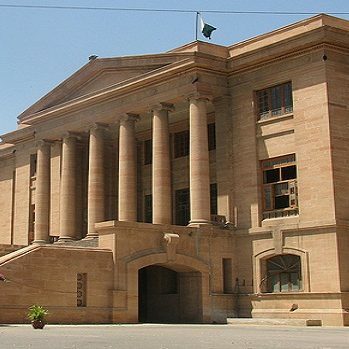 that recently the above referred Constitutional Petition was withdrawn and in the intervening period they have filled up certain Posts of Deputy Prosecutor General (DPG) through promotion, for running the Prosecution Department in an effective manner, as large number of criminal cases are to be conducted/ prosecuted throughout the Province of Sindh. 6. With the able assistance of learned Advocates representing the parties, record of the case has been examined and their respective submissions taken into account. For deciding the present case, the relevant statutes are Prosecution Law, Rules 2006 made thereunder, Commission Law and Commission Rules, which are already mentioned in the title of this order. 7. Both the above mentioned statutes and Rules have been examined. Section 7 of the Commission Law empowers the Respondent No.3 to take examination for initial appointment for such post which is connected, inter alia, with the affairs of the Province of Sindh. Similarly, Rule 2(g) of the Commission Rules defines the test to include either one or more; (a) written examination (b) interview and (c) viva voce. In terms of Rule 3, the Commission is empowered to conduct test for initial recruitment for the civil post in BPS-11 to 22. Section 14 of the Prosecution Law contemplates that except for the Prosecutor General, the members and staff in the Sindh Criminal Prosecution Service is to be appointed and governed under the Sindh Civil Servants Act, 1973 and Rules made there under. The induction in the Sindh Criminal Prosecution Service (as defined in Section 2 (o) of the Prosecution Law) can be made through three modes as provided by Rule 3 of the Rules 2006; (i) by initial appointment on regular basis on the recommendation of the Sindh Public Service Commission (ii) on contract basis for a non-extendable period of three years on the recommendation of Selection Committee as constituted under Rule 5 (of the said Rules) and (iii) through promotion / transfer as contained in Rule 9. Further information regarding inclusion of written test qualified candidate for new recruitment under the selection process can be solicited from AUJ LAWYERS. Feel free to contact us in case you need any clarification and/or require legal assistance regarding similar matters. This entry was posted in Actus Curiae Neminem Gravabit - Act of Court Shall Prejudice No Man, Case Laws, Constitutional Law, Employment & Incentives, Knowledge - Constitutional Law, Litigation & Arbitration, Public & Admin Law, Recruitment Criteria, Sindh High Court, Solutions - Constitutional Law, Written Test Qualified. Bookmark the permalink.